World famous sitar and surbahar maker Hiren Roy was born in Bangladesh in 1923. At age fourteen he came to Calcutta, not with the dream of becoming an instrument maker but rather to learn the art of sitar playing. He studied with the famous musicologist Bimalakanta Roy Choudhury of the Imdadkhani gharana and later from Smt. Annapura Devi in the Senia Maihar style. In his earlier years he was also influenced by elements of the music of Lakshman Bhattacharjee. 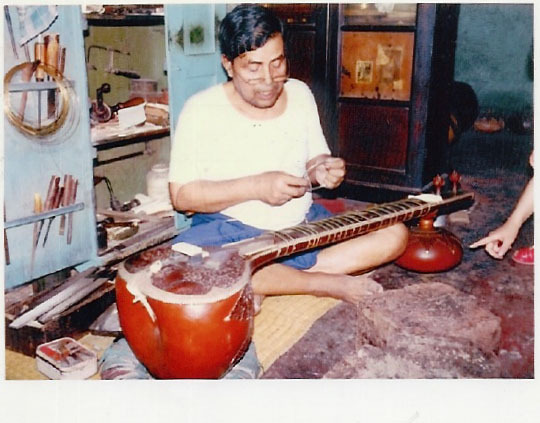 Lacking enough money to buy his own sitar and pay for lessons, he took a job in the shop of Yogesh Chandra Chakraborty and also did odd jobs here and there in order to buy wood, gourds and tools for making instruments. 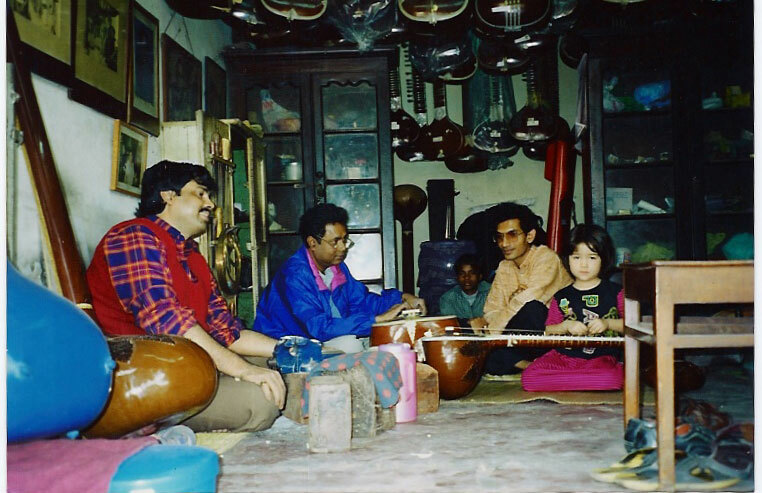 He started making his own sitars and found that local musicians praised his work. With that, Hiren Roy established his own shop in 1943 and spent the rest of his life researching the various aspects of sitar sound, design and composition. His assimilation of different styles of sitar playing gave him insight into new ways to improve on sitar design in terms of look and tonal quality. He made the tabli (wooden cover on top of the gourd) and the Dandi (the neck) strong enough to withstand heavier strokes on thicker strings. thus making it more appropriate for meend (bending) which is an essential element of Indian music. This added to the clarity of tone and optimized the balance between the sound inside the gourd and the sound produced outside. Many great musicians, such as Pandit Nikhil Banerjee, Ustad Vilayat Khan, Sm. Annapurna Devi, and Pandit Ravi Shankar have sworn by these instruments. For his lifetime achievement he was honored in 1971 by the cultural forum called” Nikkon” in Calcutta. In the eighties he was selected by Vishwabharati University to be a member of their interview board. A documentary film on his life and work had also been made. Hiren Roy died in December of 1992, and didn’t do much work in the last years of his life, although he came into the shop every day. He had three sons that he groomed to carry on his tradition. His oldest son Himangshu ran the business until his own early demise in 1997. Middle son Amit has pursued a career as a sitarist, learning from Nikhil Banerjee and Smt. Annapurna Devi, and is now living and teaching in Japan. The family tradition is continued to this day by his youngest son Barun Ray. Barun, like his father, is a musician and an innovator. Barun has won praise from great musicians for maintaining the family quality as well as for adapting to changing times. For example, with horn for bridges becoming scarce, he has lead the way in inventing synthetic bridges that are durable and need jawari less often. In the last few years, Barun has closed the famous Hiren Roy shop on Rash Behari Ave. in Calcutta. He continues to work out of his house and will continue to provide us with his beautiful instruments. He has changed the name tag on his instruments from "Hiren Roy and Sons" to "Barun Ray, Hiren Roy's Son” and in the tradition of his illustrious father Hiren Roy, he continues to make some of the finest sitars in the world.